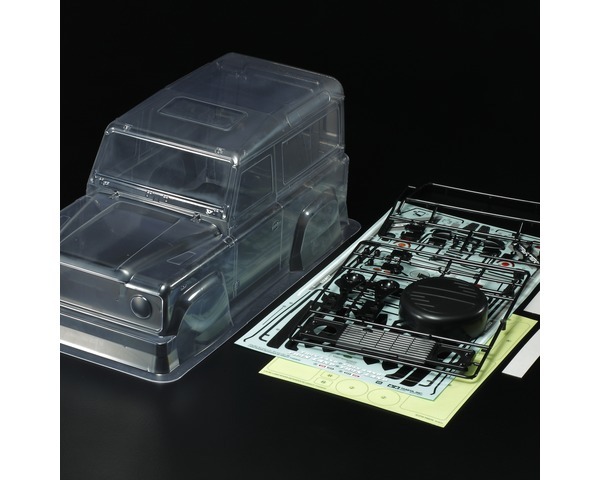 This is a spare R/C body parts set of the Land Rover Defender 90. It is made of durable polycarbonate material with detail parts made of ABS plastic. The body can be mounted on Tamiyas CC-01 and CR-01 truck chassis machines. Separately molded parts include: grille, side mirrors, light cases and tire cover. Compatible with 5mm-diameter LEDs (White) x2 for headlights and 5mm-diameter LEDs x6 for the rear. Comes with stickers to recreate markings, plus window masking stickers for use when painting. Compatible with CC-01 and CR-01 (may require trimming) chassis cars.